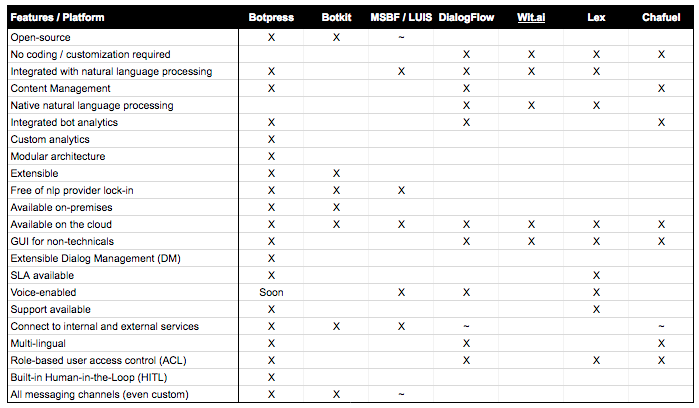 The matrix below compares Botpress to other leading chatbot platforms. Examining the matrix allows you to clearly see the differentiated strategies of each platform. There are a number of dimensions on which these platforms can be compared. Each platform has committed to an approach for their own reasons including their desire to meet the requirements of their target users. The following explains why Botpress chose a particular path over the alternative. Botpress chose to prioritize developers over super users for building bots from scratch. The downside of this decision is that the learning curve to get started is higher and certain parts of the platform are hard for non-developers to use. Even the visual flow builder allows developers to do “customizations” that would be hard for non-developers to do. The upside of this decision however is that the overall flow design more efficient and more intelligible to developers than a flow that needed to be hacked together using a generic flow builder. Ironically, the ease of use for super users is better (after the developers have done their work) than for a generic framework because super users can use customized screens instead of using generic screens that need to be hacked for a purpose. Of course, Botpress has screens for super users out of the box that are separate from the screens aimed at developers. For example, the admin, analytics, NLP and content screens (including multi-language screens) are built for super users to be able to perform their role without relying on developers. We took the decision to prioritize developers over super users when building bots from scratch because it is invariably the case that once a bot is started people realize that in order to make the user experience better they need custom tweeks to the behaviour that isn’t possible in a generic system. Open platforms allow developers to access source code and serve as middleware connecting many relevant third party services. Botpress chose to make the system open because in an emerging field where technological breakthroughs can come from anywhere, it is important to be able to easily access the best in class tools from your platform. It is also critical that your bot is easily extensible and can be modified to accommodate future use cases or new technology. It is also often the case the chatbot ends up as a front end for many internal legacy systems so the ability to integrate different technologies needs to be at the heart of the platform. Botpress chose to prioritize building the platform to be customizable rather than building it to be built for purpose. Unlike built for purpose systems, every component and every user interface on Botpress is designed to be customizable. In addition, the system is fully extensible as it is easy to add new components or screens. Making the system customizable is, of course, a way of making the system more useful to developers who are the main users of Botpress. The more components and screens that Botpress offers out of the box, the more useful customizability is in being able to modify existing components for a particular use case. Botpress chose to offer features for all users as opposed to just end users. All platforms offer some functionality for backend users such as admin and analytics portals, however only Botpress makes this functionality comprehensive and central to the bot by allowing unlimited customization of the way this functionality works and by allowing any new or customized components to be shared between all bots. Essentially Botpress is a CMS for chatbots. Botpress chose to be modular vs. monolithic because it was built with third party developers in mind (as opposed to only internal developers). This architecture allows extensibility and sharing in a way that is not possible with monolithic systems. What is a bot - on the inside?